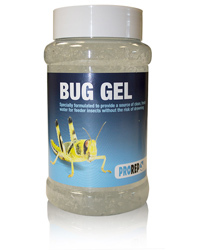 ProRep bug Gel is specially formulated to provide a source of clean, fresh water for feeder insects without the risk of drowning. Precautions: Not for human consumption. Wash hands after use. Clean up spillages to avoid slip hazards. Directions: Place a small amount of Bug Gel in a shallow dish and place in the feeder insects enclosure, ensuring that the insect can get to it. Use only enough Bug Gel that will be consumed in one day. Replace Bug Gel daily as it will go mouldy if contaminated with uneaten food.